Sleeves and I have a love-hate relationship. I love them because, well, they’re sleeves. They keep me warm. Sometimes they even keep my ears and nose warm if I create inventive sitting positions. I hate them because knitting them is the equivalent of trying to control a violently sprouting weed or possibly even a ravenous herd of goats. 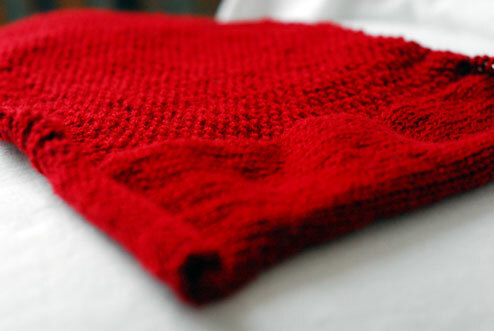 On this occasion, it’s the sleeves of my Minimalist Cardigan. The body went swimmingly. I even grafted the front borders at the back of the neck. But the sleeves? The first one was too big. Too big as in the cuff was certainly big enough for the two of us and possibly even Alb, too. A triple teapot cozy. A giraffe scarf. The second one was definitely the right size but – and that’s a noone-to-blame-but-myself-‘but’ – my increases were very odd. The result was a pretty sleeve with a tumor. Not even a tumor you could cover up. It was a very, my goodness, your arm is growing suddenly in a contrary direction type of tumor. I must stress that each of these attempts involved at least ten inches of moss stitch. There have been some distractions, of course. 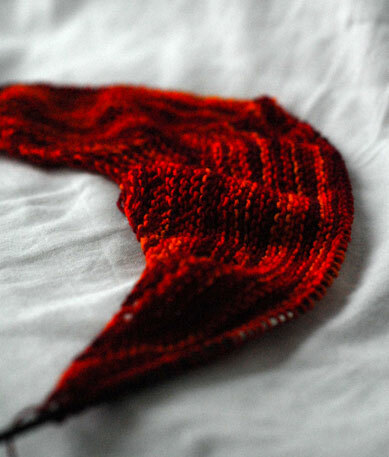 My Fountain Pen Shawl totally ran out of yarn. 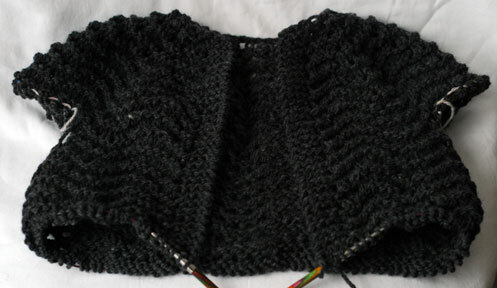 I ripped out the half border I had knit as well as a repeat of the main chart. 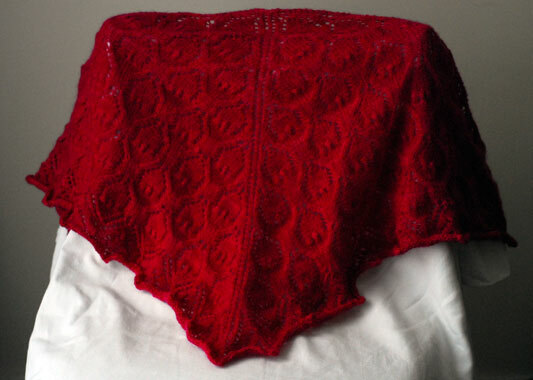 I have now reknit half of the border and still… still…. do not have enough to finish. 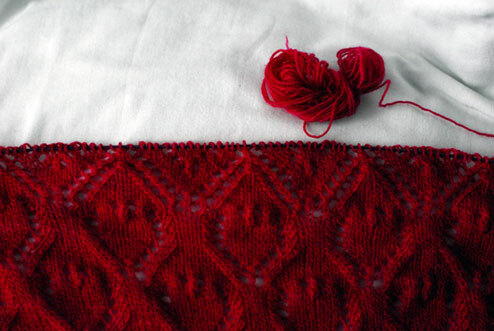 I am going to need to take out another two repeats of the main chart. Still, when all is said and knit, there is nothing to take the sting out being thwarted at every stitch like the prospect of new projects! Hope springs anew! Check these guys out. First up there’s Liesl, an oldie but a goodie. 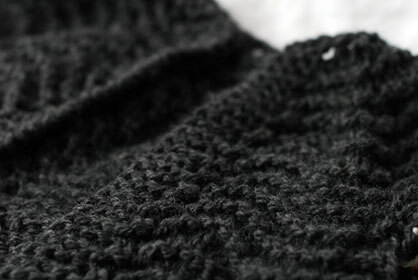 Then there’s the Vine Yoke cardigan. This free Tokyo tshirt pattern has me very excited! 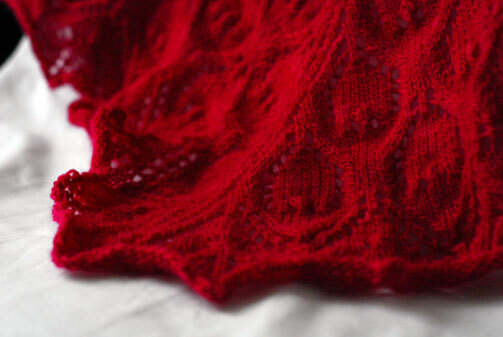 And then there’s Girl Friday, for which I have a gorgeous smooshy sea-blue aran wool. Don’t get me started on Game Knitting! And possibly the best thing since sliced bread – or at the very least, Owls – Get Off My Cloud. My usual reason for not posting in a while is that piano things have gotten very busy. This is partly true – I started college last week and my schedule still isn’t set in stone yet. 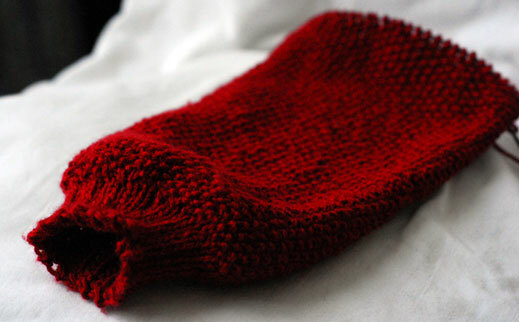 But really, somewhere in my head I eloped with my knitting this week. …we ran out of yarn. I was stunned. 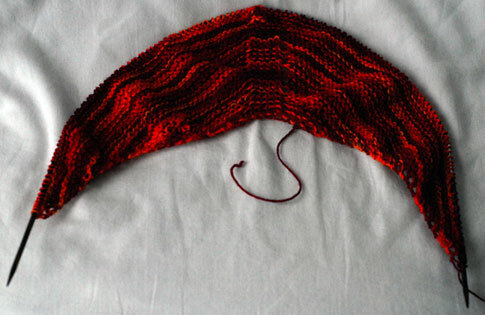 You mean… this skein… had an end? An End? We looked at each other for a while until eventually I realised that there was nothing I could do to save the relationship. The best thing for both of us is to see other projects for a while. So, really, when you think about it, the moon and earth were perfectly aligned for my reunification with the Minimalist Cardigan. It was meant to be. (I seem to be saying that a lot this week). Look at that wee curl on the hem! The subtle texture of the moss! The grain of the chain-plied yarn! After my false start, it is nice to have something that is truly fool-proof. And of course, although the curl of the hem is cute for a photo, in reality I will be lining the edges of this with some pretty ribbon. … Which reminds me to tell you that Rubanesque, that fabulous wee shop of inspiration on South William St, has relocated to the ground floor of the Powerscourt Centre. I popped in there last week and it’s so bright! And big! And full of ribbons, vintage fabrics, buttons, lace… I can’t wait to finish my cardigan so I can go back and pick out ribbon for it. It hasn’t just been the knitting that’s been floating my boat recently. I have been really enjoying The Sartorialist as well as all of the latest catwalk stuff. I have been purusing Avoca – sort of the Irish equivalent of Rowan in a way – and thinking about clothes, knitting and their function in general. I think a lot of people consider ‘fashion’ to be whatever is trendy at the moment. I, however, am increasingly of the opinion that ‘fashion’ can be better interpreted as a sense of costume. To approach how one dresses, and consequently what one sews or knits, from that point of view makes the end result more convincing. What do you think?